Rest stops in Iowa are pretty nice, overall. This one is a little toasty at 90 degrees, but that can’t be helped. 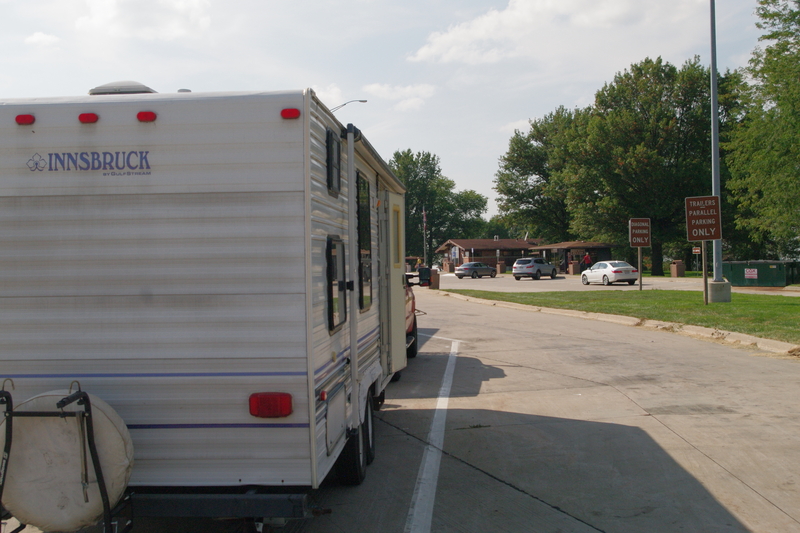 I’m not busting a gut to get through Iowa because rest stops are frequent on I-80, and they let you stay up to a day. Illinois is more like 4 hours and Nebraska is 10. So I’ll be picking up the pace in Nebraska. There’s little point in getting to Wyoming ASAP, since I’d get there before any campsites opened up on Tuesday. Labor Day traffic is up, but that means little to me since my 60 MPH cruising speed means that no one is in my way – I’m one of the obstacles to be gotten around! I was concerned for awhile because the Defiant is listing slightly to starboard, which can mean that a trailer tire is going flat and will overheat and blow. A stop and air pressure check showed that everything is fine, however. All tires are warm to the same degree, and the hub bearings are cool as a cucumber. I’ve upgraded the tires to load range D, so that, as long as pressures are kept near the higher max, there’s an extra cushion of load capacity so that they aren’t constantly running near their rated limits. Punctures aside, it’s peace of mind. Tomorrow’s jaunt will be about three and a half hours, aside from fuel stops and other time eaters. There’s little point in rushing at this stage, and it’s a whole different mindset than racking up the miles. It means a full night’s rest, a nice breakfast, and departing relaxed. I’m into that. Apart from not being able to see chillins and grandchillins, it’s just as well to escape the campground around now. Driving out yesterday on an errand, a loose pit bull and some kind of very tall hound were up the hill at the entrance. They shied away from the truck, and of being watched. Tons of campers walk their dogs down below, and I could just imagine the interesting times that could lay ahead, not to mention kicking their chase instinct into gear with the e-bike. I doubled back down to the office, where one of the desk employees said they had already been spotted wandering through camp the day before. It hadn’t occurred to her that, since they appeared to show all the signs of being on the run, that Animal Control might be an option here. Someone is missing their dogs, hopefully. I always shot for no more than 4 hours of driving time per day. That would take me all day anyway given my late starts and many stops along the way. Retirement means not having to hurry anymore. I like to think of it as enjoying the journey. Then again, with this particular rest stop being just 100 feet from the highway, limited drive time also tempers the effects of a rotten night’s sleep in the heat and noise! A long haul after that would be wearing. I’m looking forward to enjoying this cool morning and setting off at my own pace. My deal is 3 hours of driving. I stretch it to 4 sometimes. I did 8 one time. Yuck! Yuck indeed, JR! I’ve done “double drives” a couple of times when a scheduled stop turned out to be unworkable for one reason or another. Some areas work against improvised stops with the Defiant, so with the clock suddenly ticking, it becomes more time-efficient to just press on than it is to go online and hunt for something else within a reasonable driving distance. In Transport Mode, getting to a rest stop or truck stop too late in the day means no spaces available, compounding the problem. Oh, good! I was feeling kinda wimpy just wanting to do no more than 4 hours per day! It’s good to know I am in good company…. I tell myself that it’s “discerning”, since it sounds better than wimpy, Faith. In fact, for the bulk of all RV pilots, 4 hours would be considered a double-shift! Wimpy tourists unite! Thanks for chipping in, Mel. You made me realize that when I was younger and was having to book it to get across country, both Iowa and Nebraska seemed flat and boring – though my home state of Illinois is much worse. These days, my travel orientation is such that I’m noticing all of the rolling hills, and both seem pretty interesting to me in their own way. I keep looking for the endless miles of featureless flats that I remember, and they just aren’t showing up. Maybe it’s the amusement factor of watching the gauge for how much of the turbos kick in on every grade, and how much or little it’s affecting the computer’s average fuel mileage calculation. I have a low threshold of entertainment. That’s what I enjoy about riding on a trip, love taking in the scenery! Do love driving through the sandhills of Nebraska…can imagine riding horses through there would be a lot of fun! Have never been to Illinois. Have to admit I get a kick out of watching the mileage while traveling too! Safe travels! You can count your blessings. Just wanted to caution you that, given an equal choice of routes in some unseen future, avoid Illinois. The roads are mostly in awful shape, and yet always under construction with low speed limits. Little pockets aside here and there like Galena at the border, it makes Iowa look rather stunningly picturesque. The southern third may be better, but my sole visit was long ago and it’s hard to recall. Illinois is a good way to be both bored and trash your shock absorbers at the same time. Perhaps I’m so passionate about Illinois because I’ve spent most of my life there. “Passion” is not necessarily positive, I guess. On the good side, at least I learned a lot about shock absorbers!